Demolition on the existing structure at 360 West 2nd began yesterday and the developer will be building 19 condos, as previously reported here. 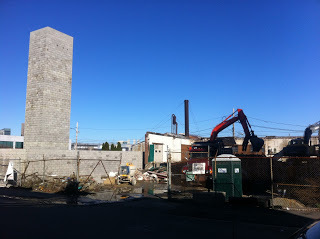 Right next door at 348 West 2nd construction of 9 condos is under way, and they finally have a foundation built. If you look at the gorgeous photo to the left, the 9 unit project currently has a cinder block foundation and elevator shaft. I'm not sure what the delays were, but it's been a slow process. Outside of these 2 projects, there's an enormous amount of construction going on in South Boston, especially on the West side. If you have kids, and like mine they are infatuated with construction vehicles, don't bother bringing them to a Touch a Truck show. Just head on over to West 1st and F Street! You can see backhoes, bobcats, excavators, front loaders, and "diggers" as my son likes to call them.